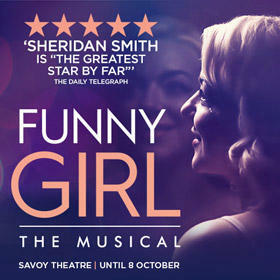 “Funny Girl first opened on Broadway on the 26th March 1964 at the Winter Garden Theatre. It later transferred to the Majestic Theatre and The Broadway Theatre and closed in 1967. The original book was written by Isobel Lennart, music composed by Jule Styne and lyrics written by Bob Merrill. The musical is semi-biographical, based on the life and career of Broadway star, film actress and Comedienne Fanny Brice. Lennart originally named the book for the show My Man; this was changed to Funny Girl during the creation of the production. Ray Stark, Brice’s son-in-law via her daughter Frances, produced the original version of the stage show. Funny Girl was arguably Barbra Streisand’s big break through her lead role in the original production. The popular hit “People” was released as a single prior to the show opening, this meant that audience members were already familiar with the song when they went to see the show and it sparked an immediate positive reaction. The original production was nominated for eight Tony Awards and the cast recording was inducted into the Grammy Hall of Fame in 2004. Garson Kanin, who was Director on the show, loosely based his novel Smash on his experience directing Funny Girl. Smash was more recently adapted into an NBC TV series of the same name. After leaving the Broadway show during the original run, Streisand reprised her role in the 1966 West End production at the Prince of Wales Theatre. The show was directed by Lawrence Kasha. Streisand dropped out of the show when she became pregnant and was replaced by Lisa Shane, wife of Peter Collinson (director of The Italian Job). A film adaptation of the musical was released in 1968 starring Streisand alongside Omar Sharif. Streisand won the Academy Award for Best Actress for her performance as well as the Golden Globe. It was the top grossing film of the year. Diana Ross & The Supremes recorded a cover album of songs from the show to tie-in with the release of the film. On 23rd Sept 2002, a concert version of the show was performed for an Actors’ Fund benefit at the New Amsterdam Theatre. The performance included Whoopi Goldberg, Ricki Lake, Idina Menzel and The Rockettes. Director Joil Newman re-invented the musical in 2014, exchanging the female role of Fanny for a male role Funnie Brice. The new character was played by Julio Cesar Arturo Valverde Monje for the tour’s opening in Buenos Aires, Argentina. The show toured Brazil, Venezuela, Ecuador and Panama. The second part of the South America Tour began in October 2015.